DBEDT celebrated the 50th anniversary of its Foreign-Trade Zone No. 9 (FTZ9) division today. The “Hawaii FTZ9: 50 Years and Beyond” event showcased 50 commemorative photos to highlight the 50 years of operations in the State of Hawaii. 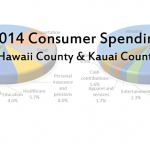 DBEDT released two reports today that provides data and analysis on spending patterns of Big Island and Kauai households in 2014. Media Advisory -- DBEDT is getting ready to celebrate the 50th anniversary celebration of its Foreign-Trade Zone (FTZ) division. High Technology Development Corp. — HTDC is sponsoring the third annual Honolulu Mini Maker Faire on Saturday, June 25, from noon to 5 p.m., at Iolani School. The Honolulu Mini Maker Faire takes after the national Maker Faire by Maker Media, which launched in the Bay Area in 2006 and spawned more than 100 independently produced events worldwide. DBEDT through its attached agency, the Hawaii Strategic Development Corporation (HSDC), announces the fourth annual MaiTai Maui Tech Night, a signature Startup Paradise event held in partnership with a group of Silicon Valley venture capitalists, tech executives and entrepreneurs.